Ahh, another day done. This morning I threw down a banana and some microwaved eggs before blasting to the train station just in time to jump on the train right before the doors closed. I call that a close call; Hulk calls that perfect timing. Once again I was going to eat my packed lunch when I realized most of my coworkers were headed to Specialty’s. 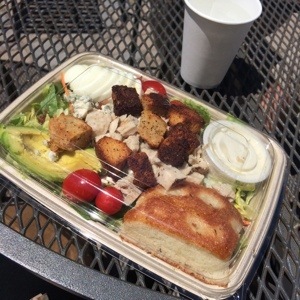 So I jumped in the car and enjoyed my cobb salad on the sunny patio. When I got home, Hulk had purchased some 7-11 hot dogs for dinner (did I mention we have, like, no food in the house?). But Squish got to mine before I walked in the door and ate the bun, leaving the hot dog. That works for me. 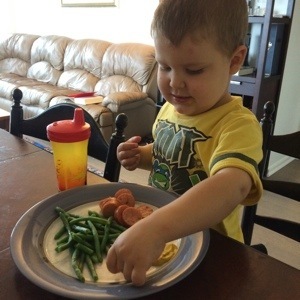 I nuked some frozen green beans and invited Squish to help me finish the rest off. I remember listing to Weird Al’s “Bad Hair Day” on repeat in high school. Well, that just dated me, you’re welcome. Anyway, Good to know he’s still around and killing it. Okay, I’m ready for bed now. See you tomorrow! I love “Girls Chase Boys” too and need to DL it ASAP!